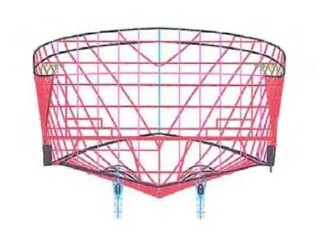 Vessel hull design protection filed. To follow is a discussion of the Velocijet Strut Keel© technology, its benefits and effect on cruising yachts. In addition to the countless hours invested by the author in keel research, (beginning in 1984) considerable twin keel research has been done by noted Naval Architect Pat Bray with Ocean Engineering Research Center located in British Columbia. British Columbia has become the epicenter of hydrodynamic research as they boast an impressive databank of knowledge on the effect of underwater foils and appendages. To our knowledge, the most advanced research in the world on this subject was undertaken on the current crop of Americas Cup Racing Yachts. Much of it took place at these centers for research. Advantages of twin keels on yachts have been discussed at great lengths. The considerable extra tooling costs and a perceived drag penalty appear to be their only drawback. The drag “penalty” can be turned into a significant drag reduction on power yachts by careful research and development. On sailing yachts, it is more difficult to completely negate the potential additional drag as sailing yachts do not normally have the variety or size of underwater appendages found on power vessels. Any additional drag, no matter how infinitesimal, is unacceptable in a racing yacht. However, when quantified, we find the initial drag “penalty” associated with a reasonably designed twin keel is equivalent to less than 1/2 knot under worst case scenarios. In real world conditions, this drag, in fact, goes away completely. It is canceled by substantially increased form stability and drag reduction that actually reduces total parasitic drag. This phenomenon is explained very simply. The underwater gear normally seen on large yachts creates enormous drag due to the generated vortices. In addition, the reduced roll moment and greatly improved directional stability provided by the twin keels reduce drag caused by yaw and roll. This benefit is available in all but absolute calm waters, a rare item at sea. Typical comparisons of similar yachts if powered by equal power reveal 2-3 knots speed advantage in calm waters with greater gains in rough seas. With the Velocijet Strut Keels©, our mission was to reduce the parasitic drag even further by either designing a completely new foil section or researching the NACA files to find a suitable profile. That foil section would allow both reduced drag and increased performance and contain the elements of design for our unique and proprietary drive system. This unique drive system would later provide further reductions in underwater drag with significant performance gains. Combined with our flexible coupling drive train, greatly reduced noise levels would result. As research progressed, our indications on paper and our actual test results on the various models we built excited us. In actual towing tests, there were remarkable gains in directional stability and roll dampening. We found our Velocijet Strut Keels© acted as passive stabilizers to dampen roll moment generated by sea conditions and consistently kept the yacht within a much narrower yaw pattern compared to a non-strut keel equipped model. In an actual at sea towing test, with a following sea, the model with the strut keels ran as if on rails in a comparatively large sea. The model without strut keels tended to yaw to considerable extremes. If speed were suddenly reduced on the strut keel model while it was located on the “downhill” side of a large wave, little or nothing happened. It simply continued straight ahead. When the same test was carried out on the model without the strut keels, its normal reaction was to immediately turn to starboard or to port, exposing the model’s beam to the following sea. At times, the wave train would cause the model to completely broach and alter course as much as 180 degrees. It became clear during this testing phase that the thesis was valid and could hold enormous promise for more comfortable cruising offshore. The next task was to design and develop a strut keel that would have absolute minimum drag characteristics, while acting as a giant bearing to support the large propeller shafts contemplated for our yachts. During the course of development, we became aware of studies done by prestigious laboratories indicating the drag associated with conventional propeller shafts was far greater than the actual size envelope of the propeller shafts. What the data revealed was an eye opener. In fact, it could better be described as shocking. An object being pushed or pulled through the water has relatively well defined and predictable drag characteristics, based upon its size, shape and velocity. For example, a 3” propeller shaft’s drag could be closely predicted mathematically and then verified. Results typically paralleled mathematical predictions closely. Until studies were recently completed, it was generally assumed the shaft’s drag remained about the same whether it was rotating or stationary. In fact, the rotating shaft’s drag increased dramatically compared to a stationary shaft. MIT and US Naval Tests revealed that a rotating shaft could produce as much as four times the parasitic drag of a stationary shaft! If the shaft increases in size from barnacles, slime, grass or other marine growth, (even small amounts), the drag figures increase dramatically. If the shaft has any “runout”, or is not perfectly true (and none are) the figure skyrockets again. It became obvious we had found a fertile area for drag reduction by enclosing the shaft inside a foil shaped strut keel with quantified constant drag characteristics. An extra benefit was discovering that enclosing the shaft protected it from the ravages of salt water and marine growth, once again resulting in an appreciable drag reduction. We became aware of research in Maine where a company found that merely enclosing the rotating shaft inside a larger, fixed, shaft tube allowed them to consistently increase the size of the propeller by 1”or more. In plain terms, that is a very substantial gain. In some cases it would be similar to increasing the horsepower of each engine by 50-60 HP., without a corresponding increase in fuel consumption and wear. We knew, by utilizing the Velocijet Strut Keels©, we could eliminate the four struts normally seen on yachts and, with them, their enormous drag and vulnerability. The Velocijet Strut Keels© enclose the shaft and bearings, eliminates the drag of the struts and protects the vital running gear from logs, deadheads, trash, and the dirty water that flows through exposed struts and their bearings. In our 30+ years of building and repairing yachts, the number one cause for bearing and running gear failure is dirt and debris in the water. Our Velocijet Strut Keel© design filters the water before it passes along the shaft inside the Strut Keels, allowing clean water to wash the shaft bearings at all times. The long, supported and enclosed bearing areas, combined with our flexible coupling system, produce an uncannily smooth propeller shaft rotation. The further we went along the research trail, the better the results and benefits became. After research told us what we needed to know regarding the size, location and shape of our Strut Keels, we began the search to improve their usefulness and functionality. For our friends in England, Nova Scotia and other locations where the tidal range is so drastic it requires drying out between the tides, we built them strong enough to support the yacht and hold it upright on the bottom while the tide is out. In fact, other than scratching the beautiful polished surfaces of the Velocijet Strut Keels©, your boatyard could sit the boat down on its bottom right on the ground. We don’t recommend this of course. The Velocijet Strut Keel© fully protect the propellers and all running gear. For those in the Pacific Northwest and our inland river systems, the additional protection from logs, deadheads, and other waterborne debris will be extremely valuable. Our original research had led us down the twin keel path because of the observation that the highest performing and most maneuverable fighter aircraft on earth have twin tails. The U.S. Air Force model F-15, the Russian Mig and a variety of French, Belgian and English supersonic aircraft all feature twin tails. If viewed upside down, these tails mimic the underwater shape of our Velocijet Strut Keels©. Obviously, these aircraft designers cannot tolerate extra drag and they must be the most highly maneuverable aircraft in the sky to survive. That they chose the twin tail configuration to achieve this goal speaks volumes. One by one, all the old wives tales and false suppositions regarding relative drag were exposed as incorrect. Near the end of our research, we concluded we could eliminate the normal centerline keel’s size. We did not need it for protection from grounding as our Velocijet Strut Keels© protect the propellers far better than a large central keel. In fact, it can be strenuously argued that a large central keel actually diverts logs and other debris into the propeller’s slipstream due to the large pressure wave formed by the flat sides of the keel. Once near the slipstream, the propeller acts as a giant vacuum, literally sucking the debris into the propeller’s spiral. The central keel is not needed for directional control purposes, as the Velocijet Strut Keels©, far aft, make the yacht want to go straight as an arrow compared to a central keel yacht. In fact, further research indicated that on vessels with a very large main keel, the main keel actually caused the yacht to broach when a large wave train passed beneath it. If the large keel was exposed to the passing wave at any angle other than parallel, the wave pushed the big keel around and caused the yacht to try and trip itself over its own keel. My own experience at sea, with many yachts with large keels from one well known manufacturer, verified their tendency to be very difficult to steer in moderate following seas. In large following seas, a constant vigil is required and, at times, throttle and clutch adjustments are required to prevent a dangerous broach. In recent years, while caught in bad weather off the Southwest coast of Cuba in a popular 42’ trawler, it required a great deal of strength, skill and determination to get the boat into a bay and protected waters. We found that, as the boat heeled one way or the other, the large main keel became a wing, lifting the stern of the boat and depressing the bow. This caused the boat to yaw dangerously and expose the beam-ends to the following sea, exactly what we don’t need! By eliminating the central keel, we achieved a very large reduction in parasitic drag from the total underwater profiles. In plain language, the boat will steer much better and run faster with improved economy compared to a conventional central keel. A general discussion of the merits of the design follows and we wish to give credit to Robert Beebe (Voyaging under power), Ted Brewer, (Understanding Boat Design), Pat Bray and Ocean engineering for their work on the subjects. Some of their hard-earned, published research data is included in our summary below. The advantages of twin keels are many, as proven in test tanks and the oceans of the world. Their only disadvantage, as far as we can determine, is they cost more to build and you have to be more precise in your design work. If you are careful, and love quality products, neither of these are a significant obstacle. A. With Velocijet Strut Keels©, the wave train caused by the canoe body reshapes to change and reduce the fore and aft crests of the yacht’s wake. At hull speed, a “hollow” will form about amidships on most boats. You can try your own boat and observe this action. Just run it between 7-9 knots and observe the hollow area between the bow wave and the stern wave. Properly designed strut keels in the proper location, will cause a wave to form in this hollow. This wave tends to cancel out the stern wave (which is aggravated and enlarged by this hollow) and results in a reduction in the stern wave. This action causes a noticeable increase in speed for a given throttle setting. It is somewhat similar to the action of a bustle on an ocean racing sailboat or a properly designed bulbous bow on a displacement cruiser. In our design, we wanted dual speed capability, very long range and economy at hull speeds with the ability to cruise at high speed with higher throttle settings. We could not accept this large hollow, typical of planing boats and semi displacement yachts, and hope to achieve the desired speed and economy goals. Nor, could we accept the huge drag penalty of a bulb at speeds over 1.4 X the square root of the waterline length. B. The typical deep plunging of ordinary yachts is decreased by the stabilizing action of the Velocijet Strut Keels©. They are very effective at dampening rolling motion and the effect increases with speed. They provide the extra benefit of generating lift in the after sections of the yacht which reduces the need for extreme angles on trim tabs. They reduce squatting, which further decreases the wake, and, therefore, decreases frictional resistance caused by the wake. The Marlow Explorer at sea is a joy to operate as numerous independent experts testify. C. Velocijet Strut Keels© become more and more effective as the yacht heels in a seaway. They generate enormous lift when the yacht is heeled. The full forward sections of the yacht cancels the tendency to depress the bow. The leeward strut keel goes deeper in the water as the yacht heels, and the deeper it goes the more lift it generates. D. Hydrodynamicists (and all racing sailors) have known for years that a large drag reduction could be accomplished if one could keep the water flowing under the yacht from spilling across the tip of the keel to the opposite side. This water spilling over the keel bottom, regardless of the size or shape, creates vortices which increase drag. Take a close look at the tip sections of the Velocijet Strut Keels© and you will see the answer to this problem. The bulb-like end of the Velocijet Strut Keel© will force the water upward toward the root section of the keel where it is forced aft at very high speed into the propeller slipstream. That’s the whole idea. We don’t want to carry the water around with us; we want to let it slip by the yacht with minimal disturbance. If you have flown in a large passenger airliner recently, you may have noticed the “tiplets” on the ends of the wings. These “tiplets” act as end plates to reduce these drag-producing vortices. Considerable performance gains have resulted from fitting these devices to aircraft. E. Velocijet Strut Keels© increase speed with a given throttle setting. This is due to the greatly reduced wetted surface compared to a large central keel and exposed shafts, large struts and other paraphernalia. F. Directional stability is greatly enhanced. This has been proven in tank tests, model tests and real life yachts. G. Rudder size can typically be reduced which further lowers drag, reduces power requirements and promotes better economy. The scientific reason is that the water is “shaped” to meet the rudders by the smooth foil design of the Velocijet Strut Keels©. The water strikes the rudders at a much better angle compared to the angular vortices generated by a large main keel and the disturbances of exposed shafts and rudders. As the rudders are directly in the propeller thrust, any reduction in size significantly reduces drag. A rough starting point for rudder size reduction is 15%. This change substantially reduces drag. H. The ability of the yacht to go to weather, or up sea, is greatly enhanced. The reason for these phenomena is the simple fact that Velocijet Strut Keels© dampen roll and pitch moment by their generated form stability. Research shows there is substantial pitch dampening and any reduction in pitch and roll translates directly to reduced fuel usage, increased comfort for passengers and increased performance for the yacht. I. Stability is equal to yachts with extreme beam without suffering all the detrimental effects of an extreme beam. Righting moment is enhanced, which, once again, gives a more comfortable ride. J. With Velocijet Strut Keels©, the boat can take groundings and stay level, while protecting the running gear both from groundings and water borne debris like logs. On a large, central keel yacht, it is a fallacy to believe the central keel will protect the gear from anything other than a minor grounding. When a deep keeled yacht goes aground, it heels way over. It will look like the character on the tricycle on the popular television show “Laugh In” of a few years ago. It goes along and all of a sudden careens over, usually damaging the rudder, prop, and sometimes the shaft. So, why does the industry continue to pursue old technology? Frankly, we have wondered the same thing many years. The old status quo, or “fat and happy” syndrome probably explains it. It is a lot of work to do the research and development and they have orders in hand for the old stuff now, so why bother. That mentality is personified by many large companies in the marine industry who continue to use common polyester resin in their laminates when the evidence is clear it blisters easily, is a poor adhesive and emits volumes of harmful chemical vapors into the ozone layer. Of necessity, this discussion is less technical than required for a thorough examination of the complex issues surrounding the hydrodynamics of Velocijet Strut Keels©. We hope it sheds a bit of light on the subject for you. We will continue to think with a “clean sheet” and pursue innovative answers to complex problems.